This is a food blogging event. Deadline: (updated) May 17, 2006. 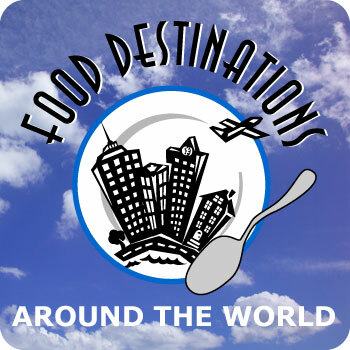 Email address: fooddestinations [at] gmail (dot) com. I love to travel, and I love food. So whenever I go somewhere whether it's for a 2-day business trip or a long vacation, I load myself up with information gleaned from travel books and various web sites about which restaurants to try, what local markets there are, and so on. I confess that I make researching food places a slightly higher priority than say, looking up what historical monuments and buildings I should gawk at. But sometimes that information is lacking. Lists written by staff travel writers are often outdated or just plain disappointing. What I'd really love is if someone local, who was as passionate about food as I am, could spend some time with me showing me their favorite food destinations. This train of thought lead to the idea for this event, Food Destinations. Unlike most food blogging events, this doesn't take place in your kitchen. Make a list of your favorite food related destinations in your home town. They can be restaurants, bakeries, delis, cafés, gourmet markets, green markets, kitchen equipment stores, whatever—as long as it's something related to food and eating, there are no restrictions. Just ask yourself the question, If my favorite food blogger/food lover came to my town, where would I take him/her? Then go out and take pictures of those places and describe for us why that place is so special. The goal is to have a list of great food destinations, by food lovers, that we can refer to when we're researching our upcoming trips. And even when we aren't traveling, we can still visit vicariously! You must have a blog or a web site you can post to...sorry, no email-only entries. Your blog doesn't have to be a food blog though. In your listings, please include the name of the establishment and phone number(s) and web site URL if possible. If applicable, directions via public transportation or driving directions are useful too. And of course please tell us why you think it's a must-go-to food destination. Write about the place you live, or if you are temporarily living elsewhere, the place where your heart and stomach live. Photos are good, but not mandatory. When you have posted your Food Destinations article, please email me with the link at fooddestinations [at] gmail dot com. Please note this is not the same as my regular contact address. You can post your entry any time between now and the deadline. The other has a space at the bottom where you can insert your locale name. Please do not link directly to the image here, but copy to your own server (right-click on the image and save to your computer and upload to wherever your blog is hosted). Important: The above 2 images are .GIF images, not .JPG. If you save them as .JPG images, the red background will get that 'worms crawling around' effect. So, save them as the original .GIF format to preserve that solid red background. I've also made a PDF version which you can modify if you are graphically inclined. So that's it! Hopefully we can build up a nice list to refer back to again and again. [Update]: Instead of posting as additional entries I will be updating this original post with the answers to any questions and things. [Update, posted April 29th]: I've extended the deadline one week to May 17th because my schedule is just too crazy at the moment. Of course, earlier entries are welcome! As I have mentioned, this event is not just about fancy/expensive places! Any foodie spot, expensive, cheap, fancy, hole-in-the-wall, that is publicly accessible, qualifies as a Food Destination. I have already received some submissions. If at all possible please put your listings into one blog post, and send me the link to that post. If you have different entries though that's fine too. Submitted by maki on 2006-04-04 17:56. Looks like fun! What are the fonts you used on the images? What a great idea -- and enough time to do it up right, too! It could even be done "occasionally" with a bit of focus -- summer patios, "dives", etc. I think you made a typo in your link to the food destinations page. The "/" between extra and justhungry probably should be a "." Just thought I'd mention that before too many people use it. Oops, thanks for pointing that out William! Corrected now. What an incredible event! Count me in! Teri, I got a similar question from someone else so I've answered it in the following post. What a brilliant idea for an event! What a great idea! I don't anticipate too many folk coming out to my little neck of the woods, but count me in anyway! Maki, you seem to read my mind! I was going through a dry spell of foodblogging and was looking for a new angle. Your wonderful idea remotivated me. Please count me in! I think this is a great, idea, but for me personally, my blog is already just one big collection of food destinations (+ recipes) already. You have reminded me however, I do need to work at getting my inices in better order to make the most of my 'best of' posts. and please check us out we are very unique. Hey, you keep changing the deadline. Do you want more reviews from Toronto, Canada? I added a picture to one I already sent you. I hope this means you are getting a great response! Hi Teri. I'm afraid that I had to extend the deadline by a week because my life is going haywire at the moment. If you have updates by all means please send them in, thanks! OOh, this looks like such fun. I love to talk about restaurants. Yessssssssssssssss. I love the idea. I'll be boring and write about Brussels, but as Belgium is a foodie heaven I will try to get you an 'insider' view on the really (really!) good places to go eat and drink. I LOVE the idea. thank heavens the deadline is extended!!! I took some pics this morning, only to fall into bed with a nasty bit of flu! tried to rise from my (near) deathbed to post but am lacking strength... will do it over the weekend, though!